So far there really isn’t that much that targets the serious enthusiasts on this side of the pond, but the MGB, Ford RS200, non-Super resistant Nissan GTR and Corvette C6R, Aston Martin LMP1, VW Beetle, Jaguar D-Type, and Lotus 49 should draw some interest. What really excites us is the new Super resistant cars, especially the Cars II cars and the Corvette C6R. We have a large number of customers who enjoy the heck out of their slot car racing but go at it on a more casual basis, including many who race with their children and grandchildren. These cars will be ideal for them. Hornby Hobbies, the manufacturer of Scalextric, is taking a lot of flak from certain quarters about the portion of its line devoted to cars for kids and casual racers, but we see the whole range of customers and we know from experience that the beginner-to-intermediate racers who buy these cars are not only the big majority of the market but they are also the grass-roots group from which the hard-core enthusiasts of tomorrow will come. Those who fault Scalextric for devoting a large part of its effort to the mass market and deride its beginner-oriented products often don’t realize that Scalextric’s ultra-crashworthy “kid” cars and the race sets that include them are the best thing that’s ha[ppened to the slot car hobby in decades. They have given countless newcomers to slot car racing that all-important first successful experience with the hobby that is the absolutely crucial step to keeping them in the hobby for a lifetime. The most avid racers and the most highly advanced car and track builders all had to start somewhere, and Scalextric simply does the job of giving beginners the best possible start better than any other manufacturer in the industry. In so doing they are not only building their business but also helping to secure the future of the hobby. The downside of this for some of the more advanced hobbyists, especially wood track non-magnet racers, is that the mass market requires cars to be designed with the very features they often find most aggravating. But rather than criticizing Hornby about it they should recognize that even a company the size of Hornby can’t please everybody and cover everything. It has to choose where to direct its efforts. If some feel “abandoned” by Hornby they should remember that this is no longer 1990. Scalextric no longer has to be or can be everything to everyone. There are many newer companies like Slot It, NSR, Racer, and Pioneer to serve the needs of the more advanced hobbyist, and it is Scalextric, more than any other company, that has kept the hobby going and continues to build the broad base of slot car hobbyists that makes possible all these companies’ success. And don’t forget, Scalextric continues each year to turn out highly desirable cars that many long-time hobbyists find very much to their liking. We at Electric Dreams are proud to be a Scalextric dealer, as well as a dealer for all the other quality product lines in our on-line catalog. We will continue to offer cars, race sets, track, accessories, and parts that meet the needs of the widest possible range of customers, from beginner to expert, and we believe that Scalextric will be a key product line for a long time to come. Lola T222 — This may not be the livery they use, but you can see what the car looks like. The two biggies of the models announced so far are the Ferrari 250GT “Breadvan” in digital 124 and the Lola T222 in 1/32. We expect that it will be available in more than one livery and in both digital and conventional. The “Cars II” cars in 1/32 and 1/43 scales should also be popular.No prices or stock numbers yet. We will put them up for preorder as soon as the stock numbers become available. 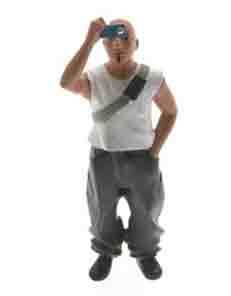 FLM132012 Renaud the onlooker – $10.59 Painted 1/32 scale figure for your racing layout. LeMans Miniatures 132026 Mazda 787B 1991 LeMans winner – $115.99 This one is not new. We’ve had them before, but now they are back. This is one of the most popular LMM cars we have ever had. Mans Miniatures 132039/5 Mazda MXR-01 LeMans 1992 – $115.99 And this is Mazda’s 1992 LeMans car which wasn’t quite so successful, taking 4th place. 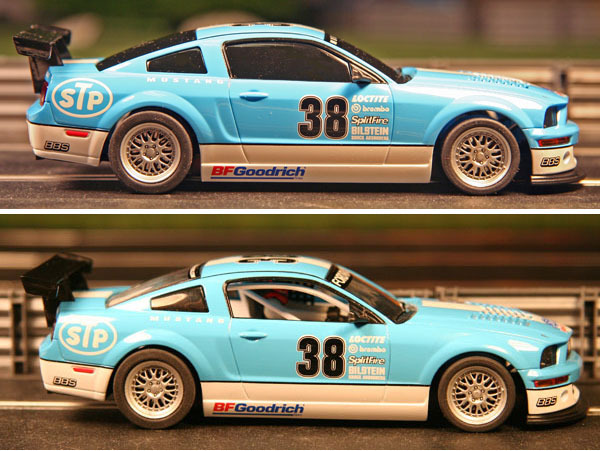 We got an e-mail recently from a customer asking id we could tell him whether it was possible to transplant the windows and interior from a Scalextric or Carrera late-model Mustang into a Ninco 1 Mustang. it seems he wanted to use the Ninco body to build a car for a race in which windows and an interior are required. This was something we had never really thought about, so we told the customer we would do some checking. And, as it turns out, the mod is not only possible, it’s downright easy. Of course, it’s only possible because Ninco took a bit of a different approach to making a “high-impact” car than Scalextric did. 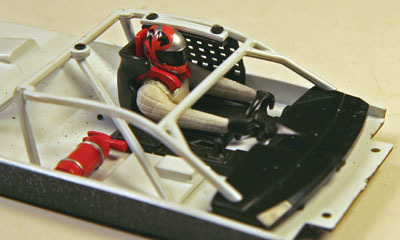 Rather than making a solid one-piece body shell and painting on the windows as Scalextric does, Ninco made the window assembly a separate part, even though it’s black and almost completely opaque to hide the lack of an interior. This suggests that Ninco at least wanted to give itself the option of producing fully detailed cars from the same body mold, but as of this writing the company hasn’t done it yet. This is unfortunate, because of the three renditions of the current-generation retro Mustang Ninco’s is actually the best looking. For one thing, it’s the latest update of the car with a more aggressive looking front end treatment. For another, Ninco has made it a model of a more serious version of the turnkey Mustang race car by including a wing, hood louvers, a deeper front valence, and a prominent front splitter in the design. It’s more like what you would see in GrandAm GT while the Scalextric and Carrera cars are models of Mustangs built to more restrictive rules for lower-level series. 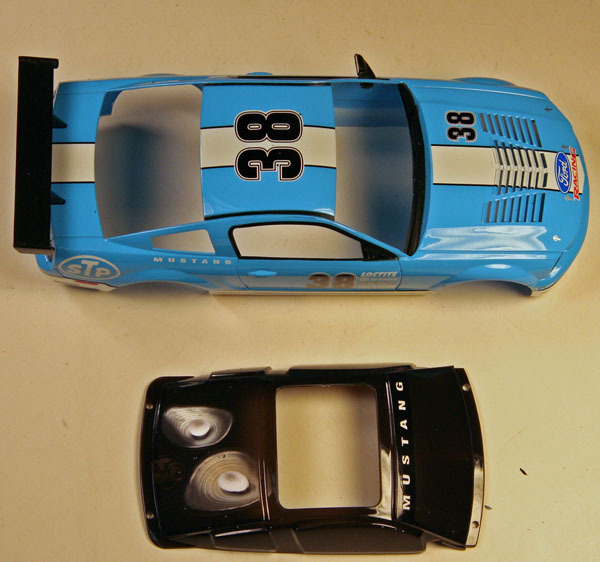 In any case, we found that the windows and interiors from both the Carrera and the Scalextric car, while not a perfect fit, are so close that when installed in the Ninco body you have to look very closely to see that they were not made for it. We think the reason for this is that the designers at all three companies were probably working from CAD data supplied by Ford. 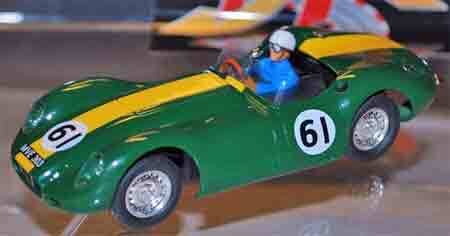 We have some experience working with manufacturers on the design of slot cars. and we’ve seen that computer technology has revolutionized the process. if three manufacturers start with the same data it stands to reason that their finished designs should be very close to one another. So, on to the conversion process. We had both a Scalextric and a Carrera Mustang available to serve as the donor car. We chose the Carrera car to give up its windows and interior because it has am interior tray rather than a full-depth tub as on the Scalextric Mustang. To use the Scalextric interior we would have had to do considerable surgery on it to make it fit over the Ninco chassis with its inline motor while the Carrera interior clears it with room to spare, greatly simplifying the project. We also liked the Carrera driver better because he comes with a more colorful helmet and a HANS Device. The first step was to remove the Ninco car’s stock “windows”. We ground down for small heat stakes that held it in place and it came right out of the body. Test fitting revealed that we needed to grind off the remains of the two rear heat stakes and remove some material from the cowl area of the body. as shown below. The Scalextric designers close to make the inner cowl and windshield wipers part of the windshield while Ninco’s designers made them a part of the body so one or the other had to go. Since it is a lot easier to remove material from the body than from clear windows we chose to modify the body. The two red arrows point out the rear heat stakes to be removed and the red outline at the base of the windshield opening shows the area of the body to be cut away. With the grinding and cutting complete it was simply a matter of installing the windows and interior try. We found that we needed to do a little grinding near the base of the windshield, in the area outlined in red in the photo below, to get a good fit to the body. We also decided to retain the blacked-out quarter windows of the original window assembly, so we cut them out and glued them in place with CA. We did this partly because we like the look and partly to hide a slight gap between the interior and the body in that area without having to add material to the interior. We then used CA to glue in the windshield and rear window. We fastened the stock, completely unmodified Carrera interior tray in place with strapping tape instead of glue. We prefer to do this when practical because the tape holds the interior quite solidly but allows it to be removed easily if needed. It’s really a bummer if a piece of your interior breaks loose and you can’t get the assembly out of the body to fix it. The tape, generously applied, also reinforces the front part of the body. With the chassis reinstalled the Mustang is ready to race, transformed from a somewhat toylike appearance to that of a much more detailed and realistic model. 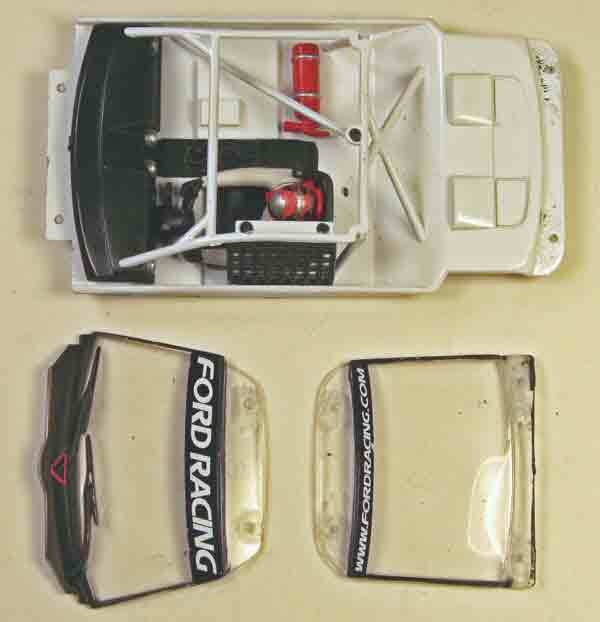 We have not tried something similar with the Ninco 1 Corvette C6R, but it would not surprise us if installing the windows and interior from a Carrera or SCX version of the car turned out to be just as successful as our Mustang project has been. If you have questions or comments about anything in this article please send them to support@electricdreams.com.